>Photo 5 shows the position of the "Tragus on either side of the head" (this is the point above the ear lobe). 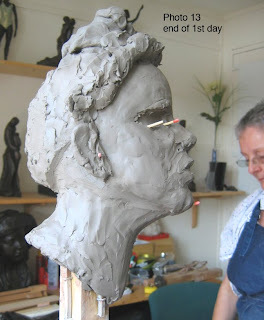 If you are attending a portrait sculpture class you will discover that many measurements are taken from this point. It is worth having a copy of sculptor Edouard Lanteri's" book on "Modelling and sculpting the Human Figure". There are many useful measurement guides in this book ie: Using callipers: measure the distance between the ears at the Tragus point and discover that this measurement also equals Tip of nose to Tragus and Chin to middle of Eyebrow. Naturally there will be exceptions but usually this is a good benchmark. When working from the live model the following are useful measurements. First pose your model. 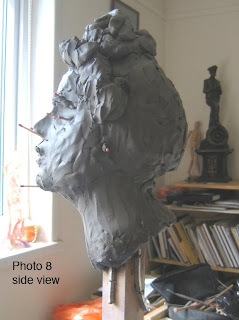 The head may look straight out in simple pose and Measurements will be similiar. If the head is angled, be prepared for "Clavicle to right Tragus" measurement being different to" Clavicle to left Tragus". Always take your measurements consistently in feet and inches or centimeters. 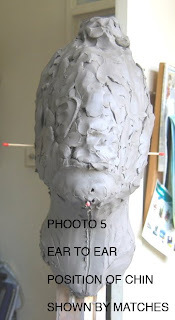 These 5 measurements set the scene for the space your sculpted head will occupy with the Clavicle being the pivotal point. A useful Tip. Draw a line from forehead to chin to indicate the centre of the head and use this as a reference to get the width of the face accurately. Always remember that nobody has a symmetrical face. There is always a stronger side which will differ slightly from the other. This is what gives faces character. Photos 6 to 8 show the most important measurement positions to get you started. Photos 9and 10show Dee checking how her sculpture is coming along. Photos 11 12 and 13 shows that Dee has sketched in a rough profile on both sides, you will notice that more work has been done on the sculpture's left profile. It is very inportant to remember to always rotate your work and bring all the elements together as a whole. It is not a good idea to work up one side without considering the impact it is having on the other. 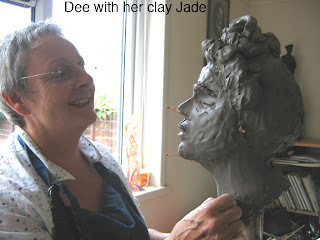 Dee has put in approx 5 hours working on copying my bronze sculpture of Jade. 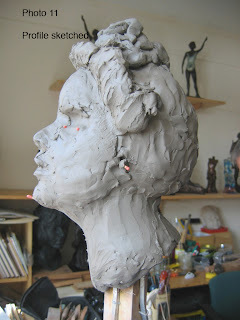 For a complete beginner, never having worked in clay before I was very impressed at what she had accomplished. 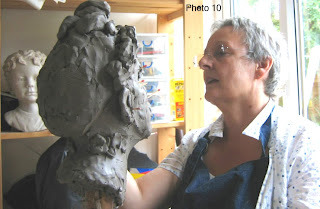 Dee has decided to come one day a week until she is happy with her clay model and then I will show her how to make a Two Piece plaster mould and eventually from the moulds show her how to cast her sculpture in Resin Bonze. To my Blogging followers out there feel free to email me any questions which I will endeavour to answer. Day 2 of Dee's journey will start shortly. Photo 4 shows that Dee is working on the "Big Form". 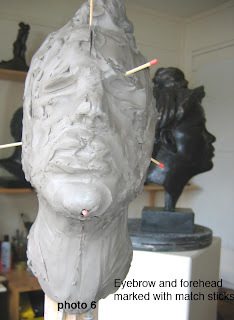 In sculpture terms this means attempting to get the general shape of the positioning of the head on the neck. Notice she includes" the top knot" of hair which immediately gives the illusion of recognition. just as you would recognise a friend from the back without seeing the features. These first important measurements set the tone for the rest of the sculpture. 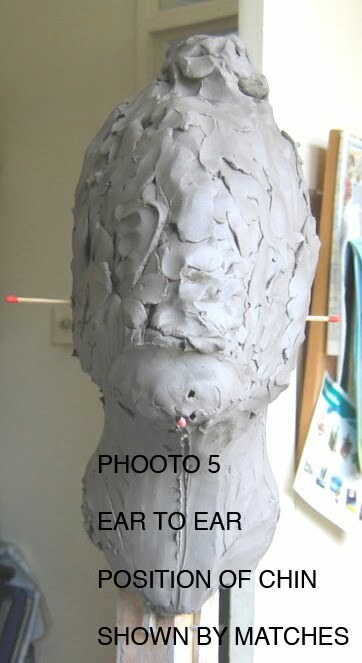 As you can see in Photo 1 there is a 2x2 inch wooden armature which your clay neck must fit securely around. To get the positioning of the chin, 2 rulers are used . One ruler is placed on the base of the neck on the Jade sculpture (horizontal fashion) and the other is placed on the tip of the jade chin making a right angle with the horizontal ruler. 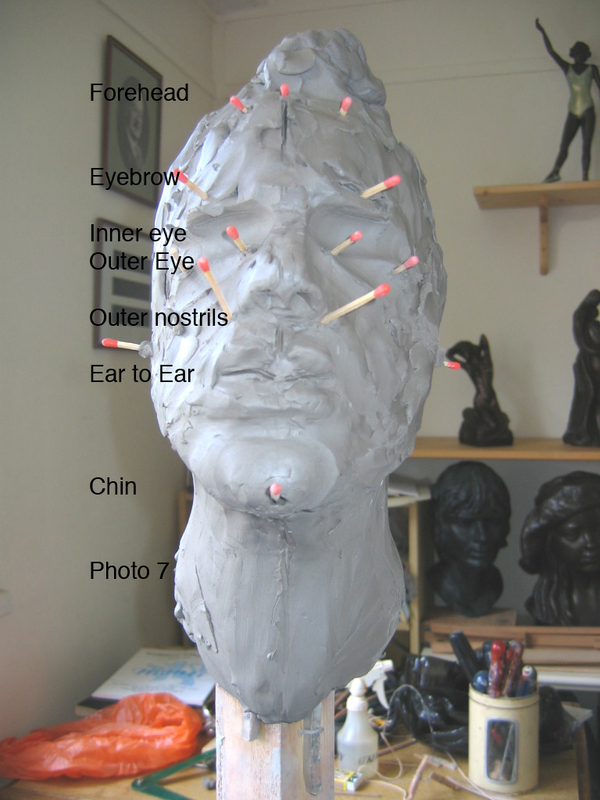 You can read off the measurements (a) on the horizontal ruler you have the distance that Jade's chin projects from the hollow in the neck (the clavicle) which is 3inches and on the vertical ruler you have the height which is 3 and 3/4 of an inch. If your Model is live this is also the technique to use. Using your ruler again measure from Jade's chin to where the neck slopes. 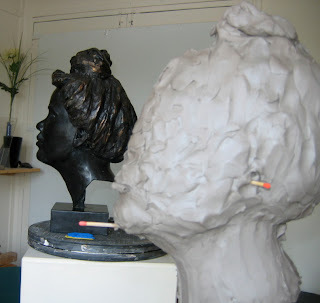 This is one important way to get the head sitting correctly on the armature and this is what I demonstrated to Dee. 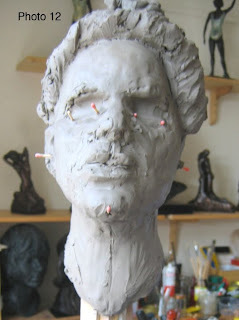 When I teach beginners how to sculpt I always use a sculpted head. They are easy to work from. You can measure incessantly and they won't complain. Your live model however will want many breaks and complain if you accidently stab her with the pointed end of your callipers.